· convenient location just above the resort centre · 5 minutes' walk to the nursery slopes, drag lift and ski kindergarten · 5 minutes' walk to ski school meeting point · nearby pedestrian lift linking you to the centre of Avoriaz. All apartments have a kitchenette with hot plates, microwave or grill/oven, fridge, dishwasher, TV with English channels and bathroom with WC. Bed linen, towels, cleaning kit, end of stay clean (excluding kitchen) and local taxes included. Infant/Baby kit including folding bed, highchair, chaning mat and pushchair, is available at a supplement on request. 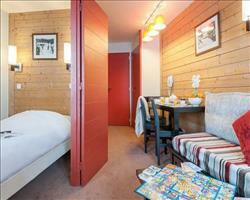 Type C Studio - sleeps 1-4: Living area with double sofa bed, bunk beds in alcove. Type C1 Apartment - sleeps 1-4: Living area with 2 single sofa beds, double bedroom. Type F Apartment - sleeps 1-7: Living area with 2 two single sofa beds and 1 pull-out bed, double bedroom, cabin bunk room. Some have a separate WC and an extra shower room. Please note: Beds are not made up on arrival unless optional extra supplement is paid. We update Antares Apartments's details often, but facilities do change. e.g. some extras listed by the supplier as "free" or included might only be for the first time you use them, or for one time per party, then charged for further use. If any specific feature is essential to your holiday, make sure you ask us to confirm the details of it before you book your holiday. 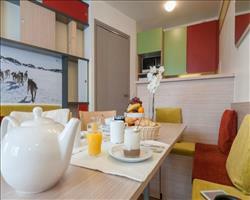 This package holiday to Antares Apartments in Avoriaz, France departs Saturday 21st March 2020, for a 7 night stay on a "self catering" board basis. A local tourist tax (Taxe de Sejour or Kurtaxe) is levied by many councils in European ski resorts. It varies by standard and type of accommodation and is age dependent, so not everyone is charged. It's not included in the basic price of your holiday and is usually paid locally. For reference, the average charged in winter 15/16 was between 50p and £2 per person, per night. 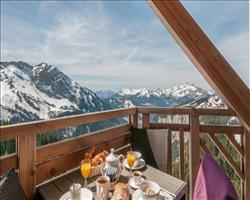 Portes du Soleil: €225. Ask for a quote when booking Antares Apartments. 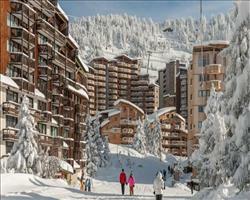 Residence L'Amara Avoriaz France, Gatwick to Geneva 21st March.